Club Nite At The Sixth Element is an event that took place on 12-Aug-2006 in Hyderabad. Get hot with the mercury rising and music escalating at the Club Nite Fever at The Sixth Element. If you're in the city and you don't know this, well, know it now! 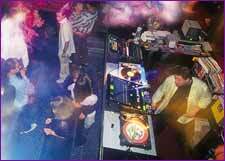 Every Saturday nite is Club Nite at The Sixth Element. Get your groove on and dance, or move around crazily entranced, while DJ Carl and DJ Jitesh play some Club-n-House, Techno and ...you guessed it...Trance. If you know them, you'll know that they're the best in spinning out some of the most wicked mixes. Please contact 5566-4488 for further details. Be the first to comment on Club Nite At The Sixth Element! Just use the simple form below. fullhyd.com has 700,000+ monthly visits. Tell Hyderabad what you feel about Club Nite At The Sixth Element!